Disney's Magical Express Transportation is a free roundtrip airport transportation and luggage delivery for guests of select Walt Disney World Resort hotels. If you are staying at one of the select Walt Disney World Resort hotels, consider yourself lucky. Disney's Magical Express will transport you from Orlando International Airport to your Walt Disney World Resort hotel, and deliver your bags to your room. You can reserve Disney's Magical Express Transportation when you book online or by calling (407) WDW-MAGIC or (407) 939-6244. Disney's Magical Express service will collect your luggage and deliver it directly to your Walt Disney World hotel room within 3 hours after you check in at the resort. The approximate travel time from the Orlando International Airport to your resort is 45-75 minutes. The motor coaches may make up to three (3) stops before arriving at your Resort hotel. 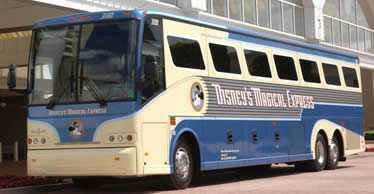 Note: Disney's Magical Express is available to all Guests staying at Disney Resorts with the exception of the Walt Disney World Swan and Dolphin Hotel and the Disney Springs® Resort Area Hotels.